Since the 1992 Earth Summit in Rio de Janeiro, the concept of sustainable development has become the basis for a vast number of “green industries” from eco-tourism to carbon sequestration. 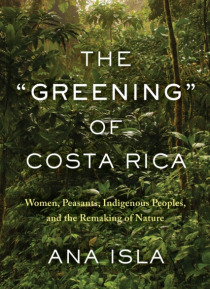 In The “Greening” of Costa Rica, Ana Isla exposes the results of the economist’s rejection of physical limits to growth, the biologist’s fetish with such limits, and the indeb… tedness of peripheral countries.Isla’s case study is the 250,000 hectare Arenal-Tilaran Conservation Area, created in the late 1990s as the result of Canada-Costa Rica debt-for-nature swaps. Rather than reducing poverty and creating equality, development in and around the conservation area has dispossessed and disenfranchised subsistence farmers, expropriating their land, water, knowledge, and labour.Drawing on a decade of fieldwork in these communities, Isla exposes the duplicity of a neoliberal model in which the environment is converted into commercial assets such as carbon credits, intellectual property, cash crops, open-pit mining, and eco-tourism, few of whose benefits flow to the local population.